Base class to derive custom Editors from. Use this to create your own custom inspectors and editors for your objects. // This is not an editor script. 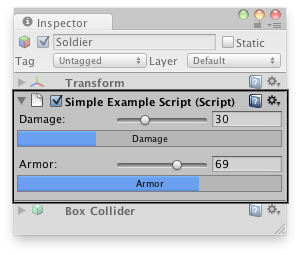 Custom editor in the Inspector. You can attach the Editor to a custom component by using the CustomEditor attribute. There are multiple ways to design custom Editors. If you want the Editor to support multi-object editing, you can use the CanEditMultipleObjects attribute. Instead of modifying script variables directly, it's advantageous to use the SerializedObject and SerializedProperty system to edit them, since this automatically handles multi-object editing, undo, and prefab overrides. If this approach is used a user can select multiple assets in the hierarchy window and change the values for all of them at once. // Show the custom GUI controls. Alternatively, if automatic handling of multi-object editing, undo, and prefab overrides is not needed, the script variables can be modified directly by the editor without using the SerializedObject and SerializedProperty system, as in the example below. // Example script with properties. // Custom Editor the "old" way by modifying the script variables directly. // No handling of multi-object editing, undo, and prefab overrides! serializedObject A SerializedObject representing the object or objects being inspected. target The object being inspected. targets An array of all the object being inspected. DrawDefaultInspector Draw the built-in inspector. DrawHeader Call this function to draw the header of the editor. DrawPreview The first entry point for Preview Drawing. GetInfoString Implement this method to show asset information on top of the asset preview. GetPreviewTitle Override this method if you want to change the label of the Preview area. HasPreviewGUI Override this method in subclasses if you implement OnPreviewGUI. OnInspectorGUI Implement this function to make a custom inspector. OnInteractivePreviewGUI Implement to create your own interactive custom preview. Interactive custom previews are used in the preview area of the inspector and the object selector. OnPreviewGUI Implement to create your own custom preview for the preview area of the inspector, primary editor headers and the object selector. OnPreviewSettings Override this method if you want to show custom controls in the preview header. RenderStaticPreview Override this method if you want to render a static preview that shows. Repaint Repaint any inspectors that shows this editor. RequiresConstantRepaint Does this edit require to be repainted constantly in its current state? UseDefaultMargins Override this method in subclasses to return false if you don't want default margins. CreateCachedEditor On return previousEditor is an editor for targetObject or targetObjects. The function either returns if the editor is already tracking the objects, or Destroys the previous editor and creates a new one. CreateCachedEditorWithContext Creates a cached editor using a context object. CreateEditor Make a custom editor for targetObject or targetObjects. CreateEditorWithContext Make a custom editor for targetObject or targetObjects with a context object. OnSceneGUI Enables the Editor to handle an event in the scene view. CreateInstance Creates an instance of a scriptable object. Awake This function is called when the ScriptableObject script is started. OnDestroy This function is called when the scriptable object will be destroyed. OnDisable This function is called when the scriptable object goes out of scope. OnEnable This function is called when the object is loaded.